“Introduction to Radio” is a three-week course run on Saturdays at South Essex College in Southend-on-Sea. The “Introduction to Radio” course runs for three weeks on a Saturday morning. It offers an overview of the radio industry, details of how a radio station works, and some insider information on UK broadcasting. The college has its own radio studio, and you get to spend some hands-on time learning how to work the equipment under the guidance of the course lecturer. “Introduction to Radio” is aimed at all ages groups, and is suitable for people keen to find out more about radio in the UK. No previous experience is necessary. The Introduction to Radio course has been running since 2002. The lecturer, Pete, has over 25 years of experience of working in UK radio. The course is commonly attended by avid radio listeners, those seeking a job in the industry, as well as those that may have had some involvement in broadcasting and are looking to learn more about the business. The Industry: An overview of commercial and BBC radio, including online and digital DAB radio services. The course takes a look at what goes on behind the scenes, and includes discussion of music scheduling, audience research, copyright and the broadcasting do’s and don’ts. Who’s who: The departments in a radio station, and the companies that make up today’s industry. Introducing the studio: What’s what in a radio studio. The broadcast clock: What makes up an hour of radio, including scheduling. Using the desk: Explaining the controls and studio technique. The course runs for three consecutive weeks from 9am – 12:30pm on Saturdays at various times throughout the year. The price is currently just £69 for all three weeks. The course is an ‘introduction’ course, and offers no formal qualification. Course attendees will receive a certificate to confirm that they have attended the course. Students that have attended the Introduction course can progress on to an advanced course. Level II builds on the knowledge gained in the Level 1 course and delves deeper into the workings of an on-air studio. Hands-on topics include show preparation, link preparation, digital editing, interviewing techniques, scriptwriting, radio advertising and Internet broadcasting. Attendance on the Level I course is required. I took the Introduction to Radio course at South East Essex College in September 2003. This was over three weekends. My tutor, Pete, made me welcome and explained the areas of broadcasting the course would cover. I knew immediately that the course would fulfill my needs when the tutor gave out the list of what would be covered. Everything was there including radio advertising and legal matters as well as the whole radio operation. The tutor allowed time throughout the course for questions, which was great, so I could fully keep up with areas which I did not fully understand and I also asked him if he would mind taking part in an interview with me as himself when I came to do my own programme on the final week, in the fully equipped studio. Pete was very encouraging at all stages throughout the course and he gave me the greatest of opportunities to get the maximum out of it which I actually did. This is a must-do course if you want to get into radio. I have always been interested in radio from a very early age and I am now fully confident in a studio as a result of this course. I had some knowledge of the radio industry before I came on this course in June 2006. Pete explored what each individual knew on the course, and taught at a level that was right for all of us. Pete taught me a lot about “behind the scenes” at a radio station, and things you wouldn’t normally know. I would certainly recommend this course to anybody looking to get into the radio industry. “The Radio Broadcast Skills course 1 and 2, though short, has giving me hope in getting a career soon. 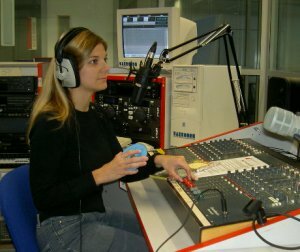 I have some experience in radio already – is this course for me? The Level 1 Radio Broadcasting course is aimed at those new to broadcast radio, or who have a basic understanding but are looking to enhance their knowledge. Many of the course students have some experience, perhaps from hospital or online radio and are looking for the basic knowledge of the industry to help move into mainstream broadcasting.